﻿The many components of the framing system make up the support system for the floors, ceilings, walls, and roof. Most San Antonio homes are constructed using timber framing and a small percentage using metal. All structures should be built to reduce the effects of shrinkage, warping, fire, and water damage. The framing system is often hidden by the finished materials on the walls, ceilings and floors. These finished materials are inspected carefully to see if they give clues to defects which may not be readily accessible. Framing systems must be inspected very carefully for defects such as poor installation, settling, rot, insect damage, and more. 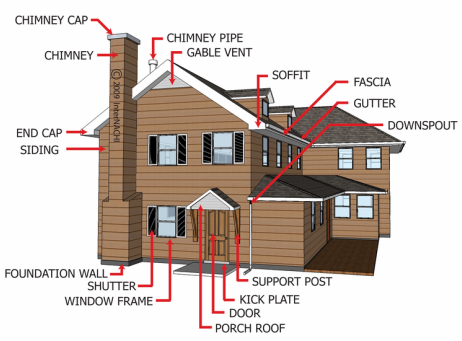 The Heating system of the home is designed to provide a comfortable and safe living environment. Each type of system has many components and aspects. Chuck's skills and experience are used to evaluate the safe operational condition of the home's heating system and to report any defects discovered. A plumbing system consists of three systems: (1) water supply (2) drain and waste disposal (3) mechanical fixtures and equipment (such as hot water heaters). Chuck will inspect and operate all fixtures and run several gallons of water through the plumbing system, checking the overall condition of the system. Leaking pipes, dripping valves, clogged pipes, corrosion, reversed hot and cold water supplies, limited hot water or inadequate water pressure are all common ailments of a poor plumbing system. Remarks and recommendations will be made to correct problems found during inspection. Quite obviously, an inadequate electrical system containing overloaded circuits or defective wiring and outlets can be a severe safety and fire hazard. The condition of the entire electrical system will be checked for any improper wiring and hazards associated with outdated methods and poor quality workmanship. The system will be operated and checked for proper cooling and airflow throughout the home. It is also physically inspected for defects and the overall condition of the system. The siding of a home is the “skin” or outer most visible facing on the building. There are many siding types such: as vinyl, stucco, brick, aluminum, wood, stone and synthetics. Each material has advantages and disadvantages which require different maintenance procedures and involve different cost factors. Chuck identifies the type of siding and explains the normal maintenance requirements of each type as well as the existing deficiencies. Gutters and downspouts are installed on sloped roofs to collect water in the gutter system on the lower edges of the roof and the downspouts direct the water away. A well maintained drainage system can help protect your future home from a leaky or damp basement, foundation issues, insect infestations and deterioration of the lower exterior finishes. Gutters and downspouts require careful inspection for proper pitch, leakage and defect. Chuck will look at the age, quality, installation and overall condition of the windows. Sometimes older windows, even though in excellent condition, can be replaced to improve the insulation quality of the home. Doing so will have a dramatic effect on the heating and cooling expenses. The windows need to be installed well and maintained to prevent leaks around the exterior and for good over-all operation. Garages, whether attached or detached, are inspected like the rest of the home. Chuck inspects the roof, exterior and interior for all the same potential problems that have or may occur which are visible and accessible. Safety hazards are also noted as they relate to the vehicle usage, fire hazards and safety of the garage door opener. Often 'homeowner handyman work' can be found in this area and will be pointed out when improperly done. The grounds surrounding the home includes items such as grading for drainage, patios, landscaping (retaining walls and other alterations to the natural flow of the property), fences, trees and bushes which may have an effect on the home; as well as all other items that relate to the exterior of the house. Patios and surrounding soil should be pitched away from the house to keep water from lying against the foundation, penetrating the basement, or possibly undermining the footings of a slab home. Trees and bushes need to be kept away from the buildings components to prevent wear, damage or present a possible safety hazard. Other items such as retaining walls and fences are often overlooked by potential home buyers/owners and can be extremely costly to repair or replace. The general placement of the home on the property is closely examined as it relates to slopes and hills, which could direct high volumes of water towards the home in more severe weather. The bathrooms of the home can be one of the most expensive areas to replace or refurbish. With simple maintenance, such as caulking and grouting of tub and shower areas, expensive repairs can be avoided. Many future homeowners badly underestimate the cost of bathroom replacement because of the underlying defects, which will require repairs. Chuck will carefully check all areas including the tub and shower areas and around the toilet in particular. These areas are more prone to hidden water damage. He will advise you of visible defects and alert you to potential hidden defects such as leaking shower pans. Bathrooms are a common place for homeowners to make cosmetic repairs which mask underlying problems. Kitchens that were installed using sub-standard materials and products will be a source of expensive future upgrades. Poor quality or worn cabinets and counters may require expensive upgrading or repair. Recent cosmetic repairs will be looked at carefully to determine the quality of work and whether or not they were done to mask a more serious problem. Chuck looks for water damage around the sink, dishwasher and refrigerator as well as for safety hazards. He also inspects these major appliances (assuming they are present) such as the stove, dishwasher, oven, microwaves. The walls, ceilings and floors of the home can be covered by a wide variety of materials and divide the home into individual rooms and areas. Many of the walls in a home can often support floors or other portions of the home above. Future home buyers often ask if they can remove a wall or if it must stay. Chuck can normally can tell what walls are load bearing and which are partition and removable. He will take note of areas where it appears load-bearing walls have been altered or removed. Ceilings are inspected for leaks from plumbing or roofs as well as for safe installations. Heavy old plaster ceilings can be a hazard when cracked and worn. Floors are, of course, looked at carefully for sagging and unevenness. Uneven floors may indicate major problems in the home. The majority of the home's most important parts are between the floors, ceilings and walls, and they are not visible for inspection. This is why it is so important to inspect the condition of these areas for indications of larger potential problems in the dwelling. We encourage clients to attend their Home Inspection. This way we can present the findings to you and explain in person. If you are unable to attend, that is okay too. Either way, you'll receive your Report by the next day.